Phen24 is a diet pill that truly unique. It’s not very often we come across a weight loss supplement that could be said to be “unique” or “different”, but Phen24 comes pretty close. 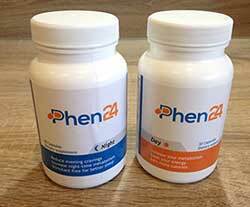 It’s not the first product that splits the formulation between two separate pills, and we doubt it will be the last but, after spending some time examining Phen24, we feel it is the best so far and it’s going to take some beating. We were also impressed to see the manufacturer points out the importance of diet and exercise. There are already far too many people trying to peddle magic pills, so its always good to see a more honest approach. 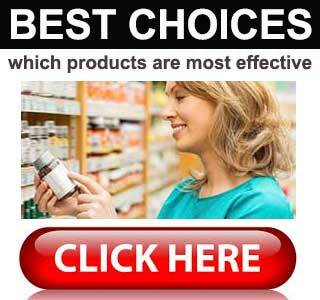 At the time of this review, the best offer is buying 3 boxes and receiving 2 boxes free. The manufacturer ships worldwide and there are no extra charges for postage, so the price you seen on the sales page is what you pay at the checkout. There are no hidden extras and customers also have the benefit of a 60-day money back guarantee. After we’d overcome our initial doubts, and assured ourselves we were not about to evaluate yet another Phentermine replacement, it did not take us long to become impressed. The manufacturer set out to create a product capable of helping people to lose weight 24/7 instead of only during the day. They achieved this by creating Phen24 Day and Phen24 Night and its easy to see a lot of thought has been put into each individual product and how they will perform together as a whole. 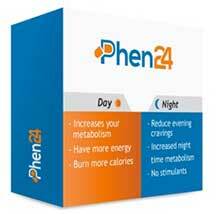 Phen24 Day is designed to boost the metabolism because a faster metabolism burns more calories. The formulation also contains energy providing ingredients that should help dieters to avoid diet-related fatigue. 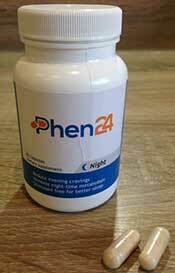 Phen24 Night is designed to boost the metabolism as well, but it does not contain stimulants. It has natural sedatives instead. 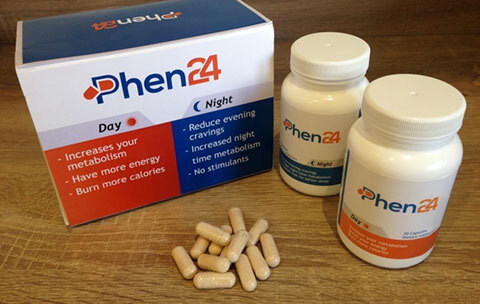 The fact that Phen24 night is designed to improve sleep quality rather than disrupt it, is one of the things we like most about the product and it gives it an edge other diet products do not have. Scientific study has revealed people who do not get enough sleep are more likely to put on weight because they are more inclined to heap extra food onto their plates and/or feel the desire to binge-out and snack of high-carb food. 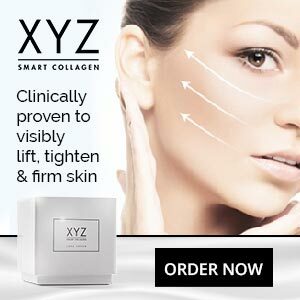 Although we were very impressed with the theoretical benefits use of this duo of products may provide, we were not fully convinced the reality would be as good as the spiel, so the next thing we needed to do was take a look at the formulations. Caffeine: A popular stimulant that delivers several benefits. Caffeine is renowned for its ability to boost energy levels and it is also a tried and tested metabolism booster that gets to work fast. Guarana Extract: This ingredient also provides caffeine, but it delivers it to the body in a slow and steady way. It will not get to work as fast as other caffeine providers, but the benefits will last for much longer. Cayenne Powder: A proven hunger-killer that also has the ability to boost the metabolism and encourage fat burning. Iodine: An ingredient that acts on the thyroid gland and encourage the manufacture of the “T” hormones that are required for an efficient metabolism. Zinc Citrate: The results of a study published in Biological Trace Element Research reveals people who are overweight often suffer from a deficiency of circulating zinc. This suggests supplementation with zinc could be beneficial for many individuals who are overweight or obese. Manganese: Research suggests adding a little extra manganese to the diet may be a good way to improve the body’s ability to metabolize carbohydrates. Copper Sulphate: A copper providing ingredient. Copper is seldom added to supplements designed to boost weight loss. This is a pity because its fat burning abilities are backed by science. Phenylalanine: A popular nootropic ingredient that can ease the dieting process by elevating the mood. Griffonia Extract: An ingredient derived from a species of African shrub. Griffonia has a good reputation for providing appetite suppression and is doubly beneficial here because it also helps promote restful sleep. Hops Extract: This beer-making essential is possibly one of the most important ingredients in the formulation because science has proven its ability to help provide a good night’s rest. Glucomannan: A high fiber ingredient that soaks up water like a sponge. When the process happens inside the stomach, the resultant swelling of the fibers creates a feeling of satiety that suppresses the desire for food. Vitamin B1, Vitamin B5, Vitamin B6, Vitamin B7: B Vitamins are a common addition to weight loss formulations because their presence can help ensure the metabolism remains in top form. Green Tea Extract: A proven weight loss provider that has the ability to boost the metabolism and increase 24-hour energy expenditure. Chromium Picolinate: A trace mineral. Chromium’s ability to regulate insulin levels and suppress the desire for sugary food has allowed it to become one or the most commonly used diet pill ingredients in the world. Molybdenum: A chemical element that improves the body’s ability to extract nutrients from food. Choline Bitartrate: A nonessential micro nutrient that encourages lipolysis and helps the body put its existing stores of fat to good use. Ascorbic Acid (Vitamin C): An important vitamin that is easily lost from the body. There is a certain amount of evidence to suggest a body that is lacking in Vitamin C may be more prone to weight gain. Phen24 is a vegetarian friendly product, but people who have existing health issues, and anyone using medication, should check with a doctor before commencing supplementation. Phen24 is not intended for women who are pregnant or nursing a child or for anyone who is under 18-years of age. 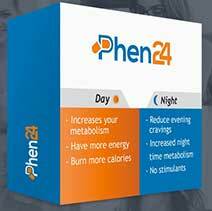 The concept of 24-hour weight loss is a good one and the two formulations that make up Phen24 contains exactly the right ingredients to make the concept work as well in reality as it does on paper. The price is reasonable and there is a money back guarantee. If we could nit-pick we would, but in this case it is not possible so we are happy to recommend Phen24 to anybody who is looking for a quick and efficient way to lose weight. 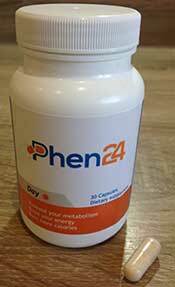 It is only possible to buy Phen24 via the manufacturer’s website. This makes it impossible to shop-around for a better deal, but the price of the product is not bad at all. Especially if you bear in mind the fact that it consists of two formulations instead of just one.